PRIMACYT plating medium is serum free.The addition of serum is not necessary when used in combination with Primacyt’s Collagen Coated Culture Plates and when the isolated cells are of good or high quality. We suggest the addition of 5% serum when cryopreserved hepatocytes are used. An initial plating time of 3-4 hours is recommended. A solid base for high plating efficiency.The medium provides a solid and probably best basis for high plating efficiency. Performance tested.High quality, performance tested with human and animal hepatocytes. Each lot is tested at Primacyt for the plating of hepatocytes that have been freshly isolated, shipped overnight or cryopreserved. Available in 500ml bottles, different sizes on request. Fast track order processing.For fast track shipments order online. Medium on stock. Shipment within 24 hours after your online order inquiry has arrived, weekends excluded. 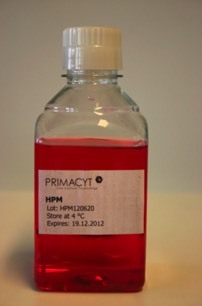 PRIMACYT offers a variety of fresh and cryopreserved high quality human and non-human cells. Optimize your plating results of your hepatocytes and provide a quality basis for cell growth and viability with our Hepatocyte Plating Medium. PRIMACYT is a member of the European Reference Laboratory Network for Alternatives to Animal Testing. We strongly support the use of serum free media for culturing cells.